All the mobile homes are owned and managed by Thomas James Holidays. 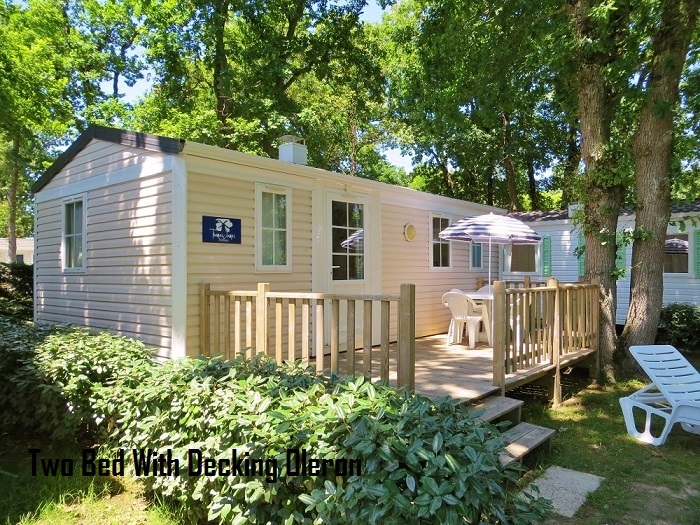 So not only do you get an affordable French family holiday you also get to stay in a modern ‘cottage style’ and well-maintained mobile home. If you tell us at the time of booking we can guarantee adjacent homes for families that want to holiday together, there is no charge for this service but we do need to be informed at the time of booking. Thomas James has both modern 2 Bedroom mobile homes, which sleep up to four or five people, and 3 Bedroom mobile homes, which can sleep up to six people. We also have wooden terraces and semi covered terraces available on our mobile homes. The mobile homes contain everything you need for a self catering holiday. The kitchen is fully fitted with a hob, grill*, full sized oven*, fridge freezer and microwave as well as having a full set of inventory. Outside there are tables and chairs, sunloungers, clothes airer and parasol enabling you to make the most of the sunshine! Our mobile homes are constructed in France and are fitted with French sockets. Some UK adapters are provided, however if you have a lot of electrical appliances then you may wish to bring some extra adapters! Pillows and blankets are provided but you will need to bring sheets and pillowcases. We do offer a linen hire service which can be pre-ordered at the time of booking. *Except Super Mercure Famille on Oleron and Oceano and some of our new Super Titania’s on Oceano. 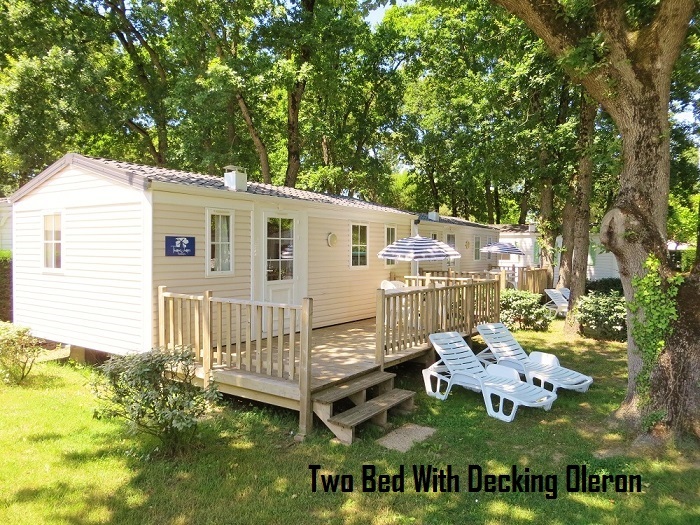 We have two different options on offer for our two bed mobile homes. 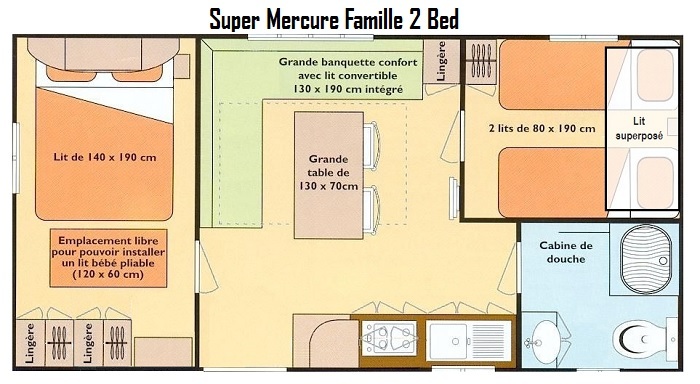 We have the ‘Super Mercure’ or the ‘Super Mercure Famille’ both of which have a central lounge. 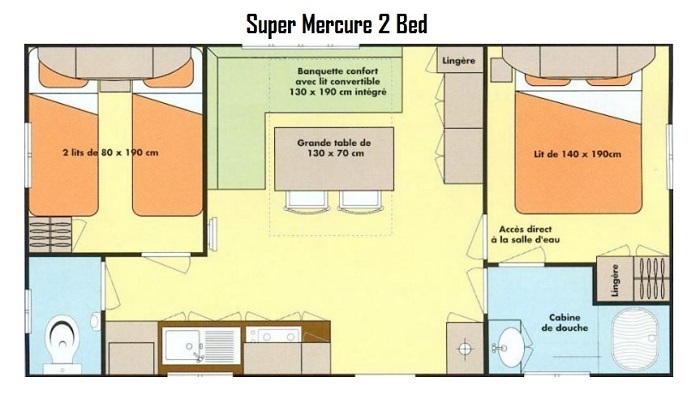 The Super Mecure is ideal for a family of four, with one double bed in the main bedroom and two single beds in the second bedroom. The Mercure Famille has a large double bedroom which can accommodate a cot alongside the bed, making it ideal for families with babies or very young children. The second bedroom has two single beds and a bunk bed making it suitable for a family of five plus a baby. Please note this model of mobile home doesn’t have an oven or grill. We have two different options for our three bed mobile homes. We have the ‘Super Titania’ or the ‘Super Concorde’. On L’Oceano d’Or we have the Super Titania and on Domaine d’Oléron we have both the Super Titania and the Super Concorde. 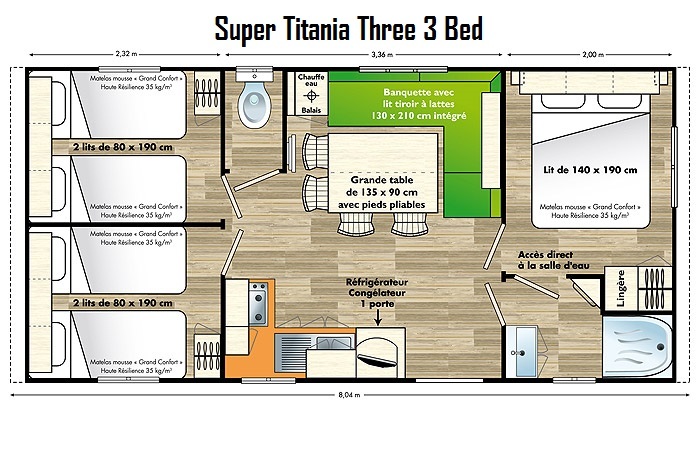 The Super Titania offers a central lounge and kitchen area, a main bedroom with a double bed and two further bedrooms each containing two full sized single beds. There is also a shower room and separate toilet. These mobile homes are ideal for older children/teenagers. The Super Concorde offers a main bedroom with a double bed and two single bedrooms, one has two bunk beds and the other has two full sized singles. The lounge and kitchen area also offers a little more space with a U shaped couch area and a U shaped kitchen area.